As a business owner, there will likely be a time when you host or organize a special event for employees and/or clients. In doing so, you want to ensure that you and your company are protected against anything that can go wrong during the event. The size of an event can range from small to large and given the scale, you will want to make different preparations to ensure that your event runs smoothly. When hosting or organizing a special event, you will want to make preparations for live performances, catering, vendors, alcohol services, keynote speakers, so on and so forth. For each of these different aspects, you want a specific type of coverage. Special Events Insurance provides you with the peace of mind in knowing that you and your business are protected and can enjoy the event. Read on to understand if this insurance is right for you. What Is Special Events Insurance? 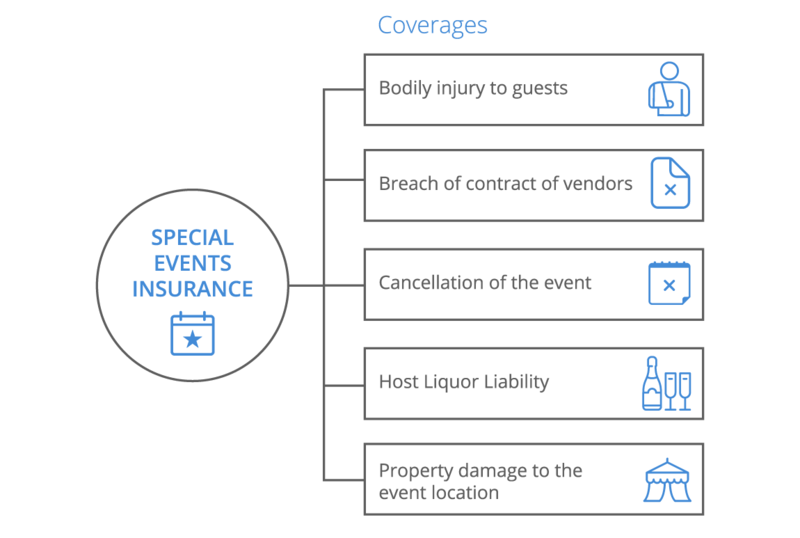 Special Events Insurance is a type of insurance that provides coverage for the different types of issues that can arise throughout the course of a special event. If you plan to have alcohol at your event, you will want to ensure that you are protected against the many consequences that can occur when people drink. 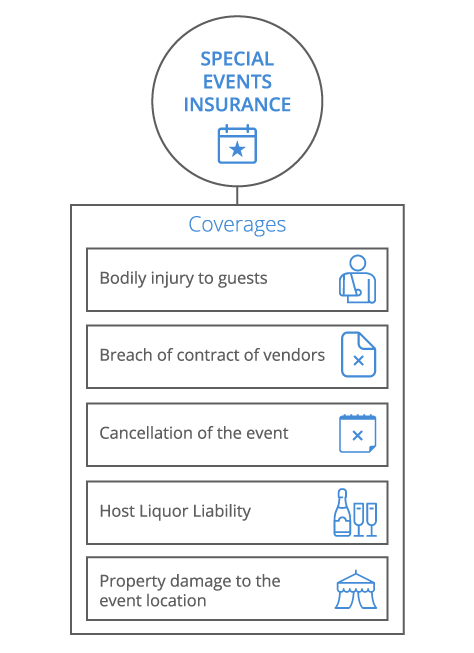 Insurance means that you and your business are covered in the event a guest drinks too much and drives home, causing themselves or someone else bodily injury and/ or damages to vehicles. If you have hired a caterer or live performer, you will want to make sure you are covered in the event of cancellation and able to find an alternative. Similarly, if the location itself suddenly does not work out, you will need to find another spot for your event and want financial protection for last minute changes. This insurance protects against anything that can go wrong with services and equipment. You want to ensure that things run smoothly for your employees and clients during an event. Additionally, you also want to protect yourself and your business against anything that occurs during the event itself. Someone may drink too much and get into a fight. The caterer might not have warned guests of allergens in the food. Equipment may malfunction and halt important presentations. In every situation, this insurance will come in handy. You want coverage that covers the specific aspects of your individual event including alcohol and food services, live performances, equipment and more. What Does Special Events Insurance Cover? Special Events Insurance can provide your business with the coverage needed to host or organize a successful special event. In doing so, you can focus more on enjoying the event itself than worrying about something going wrong. Rental Coverage Covers any equipment rented from the venue or rental house. Covers damage to the equipment or replacement cost if a total loss. If the insured rents equipment like speakers, chairs etc. and a guest breaks it the insurance covers the replacement. Third Party Property Coverage Protection for the location which is rented for the special event. If a guest spills a drink and damages the floor, the costs associated with fixing the floor will be covered. Personal Injury Coverage Protection against claims of slander and libels, false arrest, malicious prosecution, wrongful eviction/wrongful entry, oral or written slander. If allegations against your name or business accrue, the insurance will cover. Employers Liability Coverage Protection against bodily injury to employees. If your employee hurts themselves while at the event, you are covered for the costs associated with their medical and surgical treatment. Vendors Coverage Covers damage to property of the venue by the contractor. If a contractor like a band damages the floor while setting up their equipment, the cost associated with fixing it will be covered. Host Liquor Liability Protection in case of alcohol-related accidents. If a drunk patron fighting, intoxicated customers getting into accidents, inebriated guests destroying properties after the event, host liquor liability covers you. Cancellation Coverage Protection in case of the need of cancellation. In the occasion of bad weather or a natural disaster forces and you need to cancel or postpone your event, a special event insurance policy can provide financial protection. General Liability Coverage Contractors such as performers, actors etc. covered under General Liability for losses due to bodily injury or own property damage caused by the contractor. If a contractor hurts themselves or someone else, damages their own property damages, you will be covered for any costs associated. Umbrella Liability Additional Coverage Above the standard 1,000/2,000k. Certain venues require a hire coverage limit, umbrella/excess policies allow you to increase the limits to meet the venue requirements. Hired and Non-Owned Auto Coverage Covers rented vehicles used for the event as well as coverage for vehicles being used to unload equipment. If you are unloading equipment (furniture, sound equipment, etc.) via a building loading dock and damage is done to the dock or equipment this will cover the damage. What Does Special Events Insurance Not Cover? If your policy covers an amount less than the total value of the financial losses associated with Special Events, the remaining amount will not be covered. What Are the “Limits” on an Special Events Insurance Policy? A special event policy covers specific types of protections in addition to what your General Liability Insurance covers. Each of these protections will have coverage upwards of a given amount. If your policy provides coverage upwards of $1 million, then this will be the limit. As the types of coverage needed for Special Events vary greatly, each will have a different amount. If you choose a policy that does not cover the full value, then you will be protected upwards of a given amount. How Much Does Special Events Insurance Cost? The costs associated with Special Events Insurance vary in accordance with the specific policy you have chosen. Each policy is created based on the specific aspects of your event. The scale of the event will be a determinant of the types of services necessary to be contracted. Each type of contractor on site will need a specific type of coverage. Special Events can range from a small private employee or client appreciation party to a corporate funded festival. Some events may have food while others don’t. Events with alcohol have specific liabilities that may require a greater amount of coverage. Overall, the cost will be contingent upon the type of the insurance policy you choose and how much protection it affords. You may choose a policy that includes one, several or all of the aforementioned protections, each of which have their own costs. Regardless of the protections, you invest in; you will likely find yourself paying a small percentage of that amount in the form of a premium. This type of insurance helps you cover the losses resulting from criminal acts such as robbery, burglary and other forms of theft. Many businesses choose Crime Insurance policies that allow them to file claims for internal theft or other offenses with the potential to cause financial problems. This plan covers an employer in the event of an errors or omissions claim from an employee around a benefits plan. Errors and omissions covered in this plan can include failure to advise an employee of benefits they are entitled to, failure to enroll an employee, and giving incorrect advice in regards to benefits. A Fiduciary Bond and a Fiduciary Liability policy are two separate things, but they also work together to protect your business’s retirement plan or pension fund. The bond protects the plan from losses due to dishonesty or fraud while the liability coverage provides protection in the case of breach of fiduciary duty on the part of the plan managers. This is a promise by a surety to pay the obligee an agreed upon amount if the principal fails to meet an obligation that was set forth by the obligee. This bond holds the principal liable for losses should they fail to fulfil their obligations. A fidelity bond is an insurance product that protects a business from any financial losses they are subjected to as a result of fraudulent or dishonest acts committed by their employees. It is incredibly important to have if your business collects personal or financial information from customers. This bond will protect you should your employees engage in activities such as embezzlement, identity theft, or other fraudulent, dishonest activities.